Production of digital orthophotomaps and DTM of high accuracy for the delineation of Shoreline and Coastline. As part of the project “Production of digital orthophotomaps and DTM of high accuracy for the delineation of Shoreline and Coastline”, Map produced geospatial data of high resolution and accuracy alongside the entire Greek coastline, for (the Greek Cadastral Authority. For this project, we performed data-capture flights using a an aircraft equipped with a digital photogrammetric camera (Intergraph DMC) and onboard GPS/INS equipment. The GPS/INS data ensured the required accuracy of the final product, while reducing significantly the number of ground control points we needed to collect. One of the main features of this project was the weak geometry of the photogrammetric block due to the specificities of corridor mapping. For example, the small overlapping of the strips (successive strips with connected edges only) created many challenges during the aerial triangulation phase. On top, the thematic coverage of the images of the sea often exceeded 50% and lead to an adverse distribution of the necessary connection points. In addition to the above factors, the hidden areas along the coastline, with intense relief and rocky formations resulted in a project of significant difficulty that we delivered successfully. For the orientation of the images, 4.500 properly selected ground control points were measured with GPS receivers. 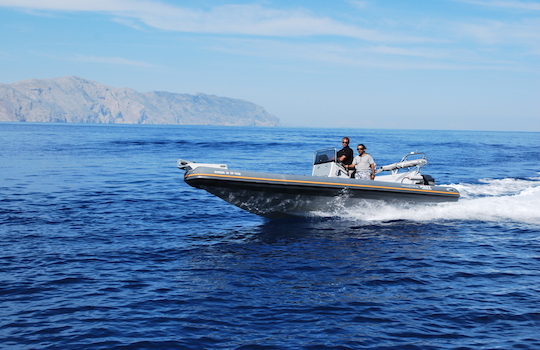 The excellent coordination of the team and the simultaneous use of three crews of speed crafts (access to remote Greek islands like Gavdos and Kastelorizo), contributed to the successful execution of the GCP collection, within very demanding time constraints. In total we delivered: 13.500 orthophotos in HTRS07 projection system with pixel size 0.25m, coastline vector data, DTM with 1m grid space and reports of quality assurance of the final product, covering more than 5.000km of coastline.